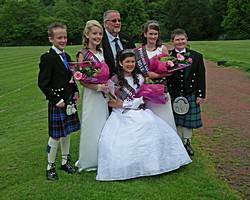 Highland Chieftain Mary Faulds leading Tartan Queen Rowan and her court to the Coronation in the 2016 Highland Games. Lesmahagow Highland Games are held every year in June in Lesmahagow, South Lanarkshire, Scotland and feature a procession through the village called the Chieftain's Parade. 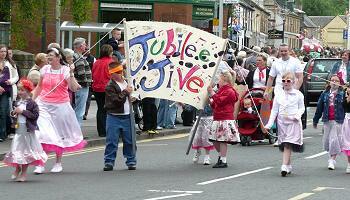 This page links to galleries of images of the Parade from 2008. More details of Lesmahagow Highland Games can be found on the official website. The weather on the 23rd June was brilliant - sunny and warm which made for a great day. 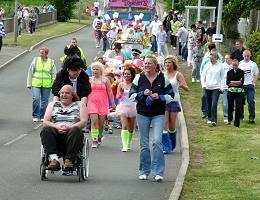 The standard of entries in the Parade was very high with some very funny and innovative ideas. Congratulations to the organising committee, Highland Chieftains Andy and Rab Irving, Tartan Queen Jennifer, her court (Millie, Ellis, Johnny and Liam) and all the participants for a splendid Parade and Crowning. These photos are of the Chieftain's Parade in Turfholm and Abbeygreen and of the Coronation on Glebe playing fields. Many commented that this was the best Highland Games ever and was a fitting tribute to the hard work by the organising committee and all participants. Defeating the weather predictions, it became warm and sunny. The Highland Chieftain was Mags Cathcart, supremo at Hollandbush Golf Club. The procession was the longest I remember, almost too long for the village street. Coalburn IOR Pipe Band led the procession as normal, but, at Turfholm, other guest bands joined the procession. Scott Fairbairn's vintage American car provided the transport for the Tartan Queen (his daughter Sarah) and the Tartan Princesses, Carly and Millie. Clansmen Cayden and Mark were in the car behind (courtesy of Henry Dorricott). Pictures taken in Turfholm and in Glebe Park. Good weather made this another memorable day. Mary Faulds, Leader of the 1st Lesmahagow Girls Brigade, was the Highland Chieftain and was escorted by the members of the Girls Brigade in the procession from Turfholm. The Tartan Queen (Rowan) and the Princesses (Emma and Isla) were all members of the Brigade. A lot of hard work by the organising committee and all participants made the day a great success. Despite forecasts of fog and rain, the weather was fine, dry and the sun broke through in the afternoon. The Olympic curler, Jackie Lockhart, was Highland Chieftain and lead an excellent Parade. Congratulations to the organising committee and all participants for all their hard work which made this such a success. Pictures taken in Turfholm, Abbeygreen and in Glebe Park. After many years of bad weather, the Highland Games finally had bright, dry and occasionally sunny weather. The parade was one of the longest I have seen and contained some excellent floats. Congratulations to all those who put in a lot of hard work to make this a success. Pictures mainly taken in Turfholm. Yet again a rather wet day for the Lesmahagow Highland Games, but the rain stopped for the Parade. Turfholm before the procession halted in the Industrial Estate. Later in Abbeygreen by the Fountain. 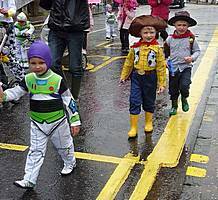 The Parade took place in awful weather - rainy and dull. Congratulations to all those who came out to put on a very good show. The crowning took place in the Fountain Centre, Lesmahagow. Most of the photographs were taken outside on the grass of the playing fields. Photographs by Rozsa Halls. This year was the official 50th Anniversary of the Highland Games. The Chieftain's Parade through the village was augmented by previous Highland Chieftains and Tartan Queens. Two series of photos show the procession in Turfholm and Abbeygreen. Two weeks before the scheduled date, the annual Lesmahagow Highland Games was cancelled because of problems with funding. A more modest Gala was arranged in haste and was centred on the Miners' Welfare Club in Kelso Avenue. This series of pictures shows the procession which went around the streets in the near neighbourhood. No pipe bands this year, unfortunately. Congratulations to all those who put in the effort to produce a show on the day. The Chieftain's Parade is part of the annual Lesmahagow Highland Games. This series of pictures shows the procession through the village with the Chieftain, the pipe bands and some of the imaginative floats this year. As part of the annual Lesmahagow Highland Games, there is a procession through the village to show the Tartan Queen and Princesses with Pipe Bands and floats decorated by local groups. This series of pictures shows the 2008 Chieftain's Parade.